JNN 08 Sept 2014 KARACHI: Allama Ali Akbar Kumaili, a Shia cleric and the Eldest son of former Senator and Jaffaria Alliance Pakistan Chief Allama Abbas Kumaili, was Martryred in a Targetted attack in Azizabad area of Karachi , here on Saturday. Mr Kumaili,Jr. 40, was about to leave his Ice factory when two men on a motorbike wearing Helmets opened fire at him as he was about to board his car .In the same attack another Labourer Juman Khan working in the vicinity was also Killed in a targeted attack on sectarian grounds in Azizabad on Saturday, officials said. More than a dozen Shia Men and a Woman have lost their lives in a spate of what is being described as Shia Target killings in the Past Week despite a Rangers-led targeted operation under way in the city. The officials said that armed men sprayed Allama Ali Akbar Kumaili, 40, with bullets as soon as he came out of his industrial unit in Bhangoria Goth near Azizabad. While the Guard was still inside the factory. The officials said that the Kumaili Jr. was hit by three bullets two in the chest and one in the abdomen. He was rushed to a Private hospital in North Nazimabad, where he succumbed to his Injuries during treatment from excessive bleeding.The incident, which caused panic and fear in the Azizabad locality, also sparked anger within the ranks of Shia clerics and parties who called the `targeted operation in Karachi a Complete failure , who are demanding a Swat Like Operation in the Karachi City to cleanse the Economic Hub of Pakistan from the Menace of Terrorism `. The offcials said a special investigation team had been set up with DIG-West Tahir Naveed as its head and the SPs of the CID, the Special Investigation Unit and the district central police as its members to probe the murder. The Inspector General Sindh Police Ghulam Haider Jamali , declared it as a Pure case of Shia Target Killing and also ordered his team members to take corrective measures to counter the threat of Shia Target Killing . Some Sectarian attacks cases registered during the past few weeks had already been solved, he said, adding that findings from those arrests could also help set the course of investigation into Kumaill`s killing. While the Notorious Terrorist Organisation Jundullah has claimed the responsibility of the Murder of Ali Akber Kumaili , which is an off shoot Organisation of Tehreek Taliban Pakistan ( TTP ) , and is responsible for carrying out Terrorist activities in Pakistan and Iran , mainly in the Border areas of Balochistan. 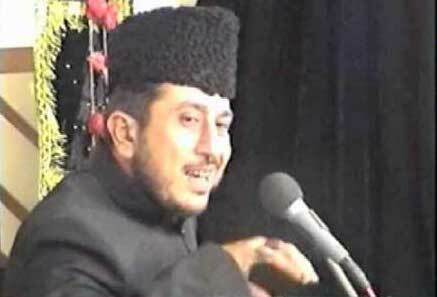 Ali Akbar Kumaili, father of three, was known for his Oratory skills and for his style of addressing Majalis-iAza. His father, Allama Abbas Kumaili, is a former MQM senator and chief of the Jafaria Alliance Pakistan. Funeral prayers for Ali Akbar Kumaili was held on Sunday at the Numaish traffic intersection , after Zuhrain Prayers ,in the Presence of thousands of People And a No. of Notables while the Burial was done at his ancestoral Grave Yard Hussaini Bagh , Lyari . The Majlis Wahdat e Muslimeen (MWM) strongly condemned the killing and termed Karachi attacks a conspiracy to damage the efforts of the armed forces in North Waziristan, where they were busy fighting Terrorists. The targeted operation in Karachi has been exposed,` said Allama Raja Nasir Abbas of the MWM. `Our government and law enforcement agencies have completely failed and there is no justification for their further stay in power. The authorities should move for a sustainable peace as the situation is slipping out of everyone`s hand. A Number of Politicians Community Heads and Notables and Shia Community Leader also Deeply condemned the Incident and demanded a Unbiased Across the Board Operation in Karachi Under the Supervision of Pakistan Army . The Prominent Personalities who visited for condolence , included Babar Ghouri ( MQM ) , Dr. Saghir Ahmed ( MQM ) , Haider Abbas Rizvi ( MQM ) , Dy Speaker Sindh Assembly S. Shehla Raza ( PPP ) , Senator Rehman Malik ( PPP ) , Allama Amin Shaheedi ( MWM ) , Allama Talib Jouhri and a Large NO. of other Well Known Personalities. The JAP announced three day mourning and the call was supported by Majlis Wahdatul Muslimeen and Muttahida Qaumi Movement. This entry was posted in Asia Pacific, Pakistan News and tagged Ali Akber Kumaili, Allama Abbas Kumaili, Allama Ali Akbar Kumaili, Azizabad, Jaffaria Alliance Pakistan Chief Allama Abbas Kumaili, Jundullah, Karachi, Senator Abbas Kumaili, shia Target Killing. Bookmark the permalink.